This t-shirt is a tribute to the famous “Punk’s Not Dead” first record by The Exploited. Those graphic and words went iconic in a moment when punk music was in its steady and unstoppable decline. 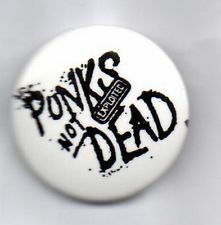 Fortunately, punk is still not dead. And the same thing must be said about film photography: with the advent of digital everybody was like “film photography will eventually disappear”. As we all know, film is not going away anytime soon. This t-shirt is dedicated to those who still shoot film, and are not willing to stop.